Saraqeb, Idlib: allegedly a government attack using chlorine, but both sides blame each other. Affecting over 30 but killing zero, this was widely denounced by Western governments, human rights and activist groups, and mainstream media. Aleppo: allegedly a terrorist attack on a government-held area using chlorine at least, killing a reported 13 people and effecting about 30 others. It's been largely ignored or downplayed by the same sources. The Saraqeb incident was preceded by local rebels shooting down a Russian helicopter the day before, killing five. The chlorine attack was speculated to be revenge, but no one was reported as killed out of about 30 affected. The witness says they concluded nerve gas was involved, because the victims' muscles stopped responding and they could not breathe. A soldier displaying similar signs is seen being brought into a clinic, washed and stripped. He seems essentially paralyzed, making small, random movements and seeming disoriented, but he apparently survives. It seems likely this was not nerve agent, nor chlorine, but something else (Hydrogen Cyanide is postulated: see talk page). The ANNA news report gives the area as "Al-square Sahet Aumit" (Aumit likely is the same as Awamid, cited by others). They also heard Harakat Nour al-Din al-Zenki is also blamed for a "strike" that some clues said "came from the area of ​​Bab al-Hadibo," perhaps meaning the Bab al-Hadid roundabout inside the Old City (rebel-held). This might be a mortar or rocket attack following the tunnel incident. “On August 2, 2016 at 19 hours 05 minutes militants from the Harakat Nour al-Din al-Zenki group, considered by Washington as ‘moderate opposition’, launched poisonous materials from the Sukkari district towards the eastern part of Aleppo. (There were also Russian reports of a strike on Salaheddin in the west of Aleppo, a possibility of two strikes from and on two or more areas, and possible confusion here - see #Locations below). Russian Sputnik News didn't hear about anything involving tunnels, but that the al-Zenki group fired "seven shells of poison gas at a local market in the al-Awamid neighborhood of old Aleppo on Tuesday night." They heard this followed a conventional strike, in terrorist style, with the second part (here, chlorine gas) delayed to target rescue workers in the same area. (It's possible the "conventional strike" was actually the tunnel blast.) One of these, apparently a fiefighter who survived, spoke to Sputnik. "...I quickly got the call to extinguish the fire in the al-Awamid market, but after arriving at the scene, another bomb dropped near the first. After a few minutes, I began to feel a shortness of breath and nausea; I was given help on the spot and then taken to the hospital – it saved my life." Initial reports had 4 or 5 killed early on. Later reports said 6 and then 7 killed. Later on, it was said to be 13. The health director for Aleppo, Dr. Mohammed Hazouri, told Sputnik News that, by August 4, a total of at least 13 had been killed. Somewhat uncleearly, they report him saying: "over five people were killed by the gas and another eight died of asphyxiation." As the report says "over a dozen" were killed, besides "over 30 others" hospitalized, he seems to mean 5 died within the first hours (and was reported as "at least") and then 8 more died of suffocation later in the night and the next day or so, also from the gas or gasses. So perhaps the at least part can be ignored and 13 taken as the final death toll. And there's an appaearance of two death types: one is very quick and killed five - by deduction, whatever was in the alleged tunnel, where it's said five died quickly. The other method is slower to kill (like chlorine is). Eye damage: they're squeezed closed but appear puffy/swollen, lines down as if from tears. Breathing/Coughing/coughing blood: it's a photo, so no coughing is observed. But he's had blood coming out of his nose and possibly mouth earlier. Cyanosis (shift to blue/purple color in the skin): this is hard to distinguish clearly from mud, but seems present and in the whole upper body (see right arm especially). 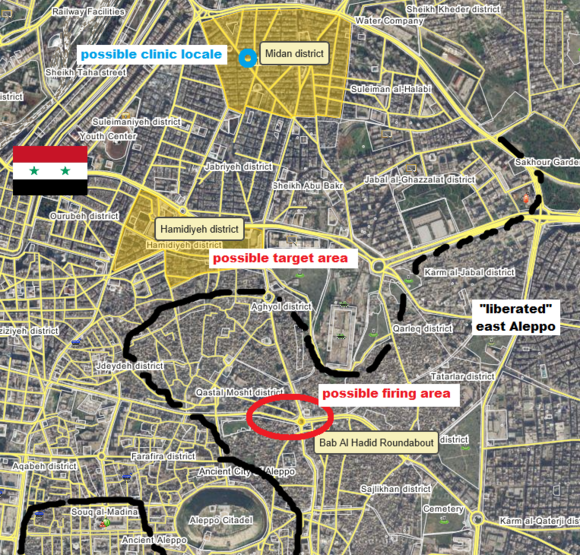 The area of the attack, not labeled on Wikimapia (in Arabic or English) is given by several sources as Awameed (variously given as district, area, market, square, or sahet (yard)). Consistently, it's said to be in the Old City. This seems to be where five died, and chlorine came, all in one place. It's said Hamdaniah was hit, but there's also a Hamidiyeh district in this area that should be a government-held, front-line area. A possible location match for the ANNA news clinic video is located about one kilometer to the north of Hamidiyeh, in central Midan district. 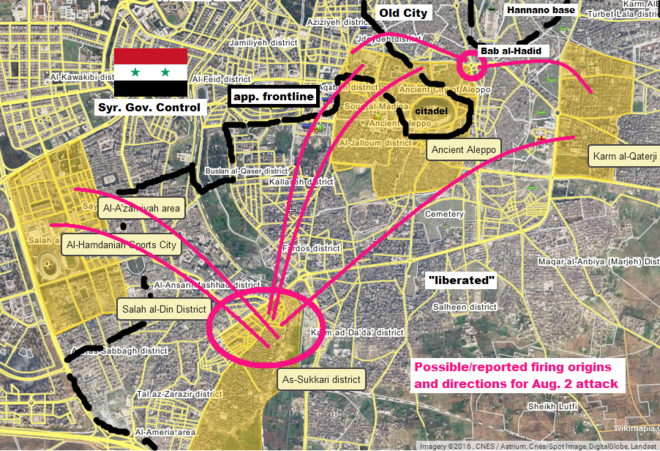 Here's how this maps out, with approximate frontline copied roughly from Peto Lucem Aug. 1 situation map. 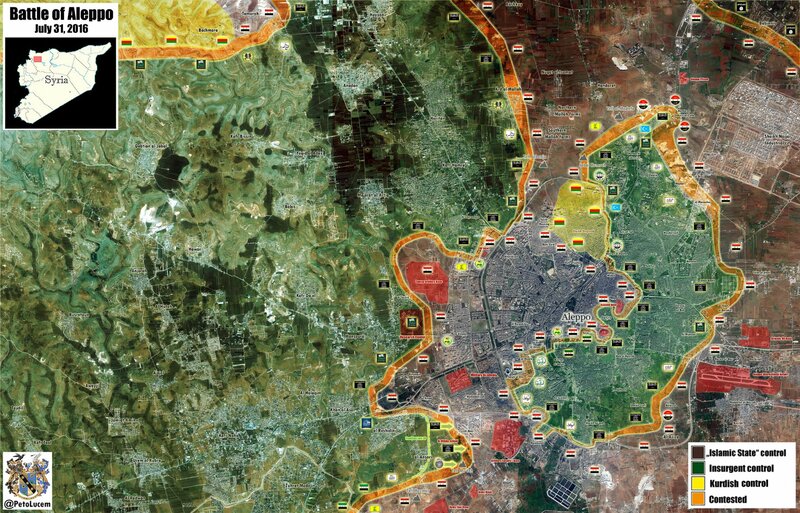 Al-Jazeera would hear about an attack this day, with no deaths or injuries, a ways further east in the rebel-held Qaterji district (see section below and lower map). RT: "A local police source told SANA that terrorist groups fired rocket shells on the al-Hamadaniyeh neighborhood, injuring six. They also targeted the Salah-Eddin neighborhood, killing two and injuring 11 more." This sounds like two different attacks. Salah-al-Din on Wikimapia, western Aleppo around the stadiums area. A al-Hamadaniyeh neighborhood is mentioned as also targeted - there's "Al-Hamdaniah Sports City" (Wikimapia) surrounding the stadiums, inside Salaheddin. But if this reports two attacks, as it sounds, it suggests Hamadiya in the old city was hit. Al Jazeera, reporting on the August 11 incident, mentioned: "Last week, there were reports of a chlorine attack in the Aleppo neighbourhood of al-Qatarji, although no one was seriously injured." 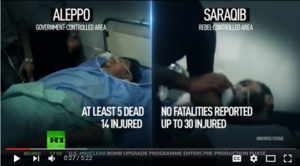 That's the only Aleppo incident they mention occurring on the same day "at least 33 people, including 18 women and 10 children, were taken to hospital after a chlorine attack in Saraqeb, a town in Idlib province," or on August 2. With zero dead and no "serious injuries," this should be a different incident than the government-reported incident. But it might be their different version of the same attack. (according to Scott Lucas at EAWorldview, this is the source for RT's Aleppo footage above, but it isn't ("The source footage for RT’s report from pro-Russian ANNA News, set to the score from the film Last of the Mohicans" - supposed to be of suspect credibility). In the Saraqeb attack, the gas, which the statement said smelled like chlorine, caused 30 cases of breathing difficulties, said the Idlib Civil Defence, also known as the White Helmets. CNN has spoken with a doctor in Saraqeb who said he treated some of those affected by the alleged attack. He said their symptoms were consistent with those "of someone who has suffered from chlorine poisoning." A photographer who took photos of the injured for the White Helmets said victims were suffering symptoms such as watering eyes, spasms, sweating, coughing and difficulty breathing. At least five Syrians have been killed and a number of others injured in a chemical attack by foreign-sponsored Takfiri militants against a residential neighborhood in northwestern Syria. Health director for Aleppo Mohammad Hazouri said five people died and eight others experienced breathing difficulties after artillery shells containing toxic gasses slammed into the Old City of Aleppo on Tuesday, the official SANA news agency reported. 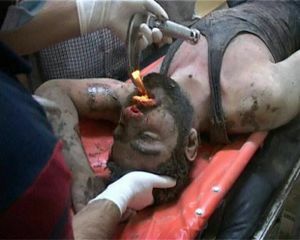 Government sources said Takfiri terrorists had also used chemical munitions against civilians in the city of Saraqib... Doctor Ibrahim al-Assad, a neurologist in Saraqib, said he treated 16 of 29 cases brought to his hospital on Monday night. He added that most of the victims were women and children and were suffering from breathing difficulties, red eyes and wheezing. Rescuers and doctors in the city said the symptoms were similar to those caused by chlorine gas. The opposition VDC lists 0 dead by gas on August 1-3. So if they blame the government for the Aleppo attack, they didn't attach the deaths to that. At least seven civilians died and 25 more were injured as terrorists fired shells, some containing toxic gas, at Aleppo, local health officials said as cited by Syria’s official SANA news agency. 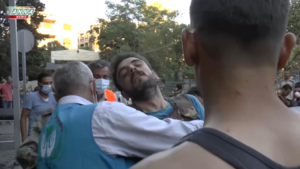 ... A terrorist attack on the Old City of Aleppo on Tuesday with “shells containing toxic gas” led to the death of five and suffocation of eight more civilians, the outlet quoted the city’s health director, Mohamad Hazouri, as saying. On Wednesday, Lieutenant-General Sergey Chvarkov, the director of the Russian Reconciliation Center in Syria, said the information was given to the US on Monday, a day prior to the attack. Several poison gas shells have been fired into the old city of Aleppo, killing over a dozen residents and hospitalizing over 30 others. Sputnik Arabic was able to speak to several residents on the ground about the barbaric attack. "over five people were killed by the gas and another eight died of asphyxiation (suffocation), after the area of the old city of Aleppo came under fire by these shells, fired by the Harakat Nour al-Din al-Zenki militant group." They also heard of a swift military response, with Russian Air Force assistance, against the suspected firing position. The Noureddine Zenki Movement vehemently denied accusations by Russia and the Assad regime that its fighters have used chemical weapons in an attack on regime positions in Aleppo. The rebel group said that Russia used the internationally banned toxic chlorine gas in airstrikes on residential areas in the town of Saraqib in rural Idlib following the crash of a Russian helicopter in the area on Tuesday. Head of Noureddine Zenki Movement’s political bureau Mohamed Mahmoud said that no one can deny the fact that only the Assad regime [and the Russians - ed] has the capacity to produce and deliver chemical weapons in Syria. In a statement released earlier on Thursday, Mahmoud said that the Assad regime continues to use internationally banned weapons against the Syrian people encouraged by Russia’s veto in the UN Security Council preventing any UN resolution condemning the use of chemical weapons in Syria. The U.S. government’s reaction to the latest incident seems to be following a familiar pattern. On Wednesday, State Department spokesperson Mark Toner gave a vague answer when pressed by Caleb Maupin, an RT reporter and MintPress News contributor. “We condemn strongly the use of any chemical weapons and any credible allegations of their use in Syria we’ll investigate,” Toner told Maupin. Earlier on Wednesday, Russian Center for Syrian Reconciliation commander Lt. Gen. Sergei Chvarkov stated that the opposition group Harakat Nour al-Din al-Zenki used poisonous gas in Aleppo city. "I haven’t seen those reports," Toner stated on Wednesday. "Obviously…we condemn strongly the use of any chemical weapons, and any credible allegations of their use in Syria we’ll investigate." Chvarkov added that the Russian side had informed US officials about the reports. PHOTO: Infant victim of regime chemical attack on Monday — did Russia divert attention from this with false “rebel toxic gases” claim? ↑ 2.0 2.1 2.2 Sputnik Speaks to Aleppo Locals Struck by 'Moderate Rebels' Chemical Attack Sputkink International, August 4. This page was last edited on 18 September 2016, at 14:49.